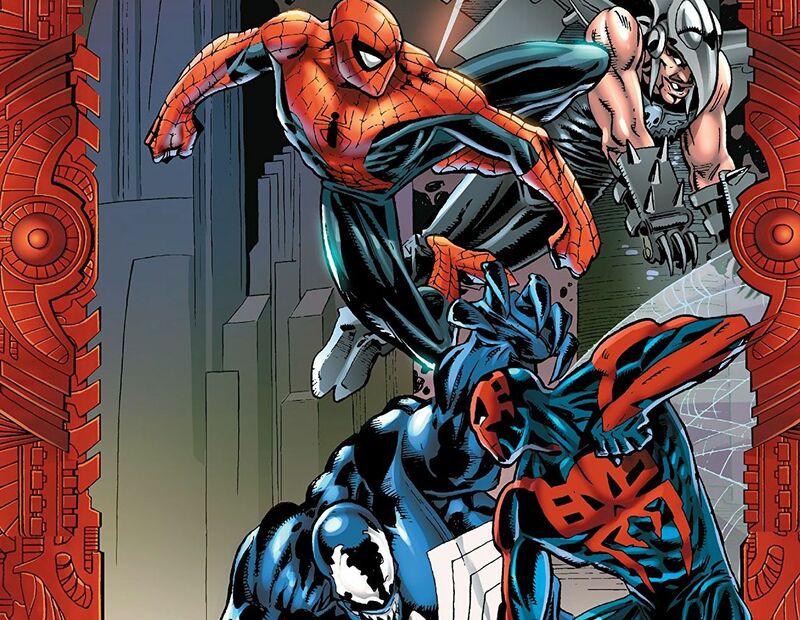 3 reasons why 'Spider-Man 2099 vs. Venom 2099' is so good it needs a redux – AiPT! A Spider-Man 2099 movie or TV show would kill. Here’s why. Spider-Man 2099 holds a special place in my heart, mostly because it came out at a time when a super rad costume was all that it took to get me to buy a comic. Released in the mid ’90s, this series was a great way to explore a different kind of Spider-Man in a Blade Runner style future. He had different powers, a different code of conduct, and some wild villains to fight in every issue. It felt new and exciting. And yet, there are faults with the series. That said, if you took the basic elements of the series it could be a massive hit either in comic book form or in movie form. Here are three reasons why. Continuing the original adventures of Miguel O’Hara, the Spider-Man of the year 2099! First, Miguel shares a body-swapping, timeline-tangling adventure with none other than Peter Parker, the ever-amazing Spider-Man of the modern day! But how does the Green Goblin of the far-fl ung year 2211 fit into the madness? Miguel finally gets back to the future, only to be drawn into the web of Doom -Doctor Doom, that is, who has taken over the United States! How will Spidey react when both President Doom and Alchemax’s Tyler Stone approaches him with…job offers? And tragedy strikes when the Venom of 2099 attacks! What is this new Venom’s secret connection to Miguel? Plus, the futuristic all-crawler faces the Man-Spider, the Impaler, the Chameleon and more! This volume opens with a fun crossover with Spider-Man and Spider-Man 2099 which is effective in introducing both characters and their worlds. From there it can get a tad complicated with the variety of supporting characters, and the fact that this collects issue #34 to 38 of the main series and #9 and #10 of the unlimited series. It was a surprise to be sure when fans first witnessed Spider-Man 2099 aka Miguel O’Hara slash a criminal across the face with his claws. This is a Spidey who doesn’t care about hurting his enemies and in fact, hurts them so bad they’ll never commit a crime or in some cases even walk again. That adds a new element for a Spider-Man character like this since he’s capable of doing things we’ve seen Batman do. This is still a hero, but more of a vigilante than the Spidey we’re used to. At the same time, he knows of the Spider-Man of old and wants to be more like him. It’s a character who knows better, but in a harsher future can’t help but be harsh himself. That’s worth exploring, whether it’s in a movie or, given the Spider-Verse film, cartoon. It’s quite clear the writers on this series like Peter David, Mark Waid, Len Wein, and Jon Peterson, to name a few, were having a blast creating new villains. Or, in some cases, a new spin on an old villain. Venom is an obvious one to bring up, and his backstory is an interesting one. He’s also as dangerous as the main universe Venom and probably more so. Other villains pop up like Vulture, a fascinating take on Chameleon and Green Goblin of 2211, all of whom give Spider-Man 2099 a run for his money in this collection. The new villains like The Man-Spider, Jumpcut, and Vlad the Impaler and interesting sci-fi villains. Jumpcut is an interesting one because he develops teleportation technology and it comes with a twist that makes his name literal when referring to film editing. Vlad the Impaler is a wild mishmash of powers, but a scary villain to be sure. It’s a fun collection and I can only imagine how much cooler they’d be if done by Marvel Studios. Since the writers and artists had an open palette to work with and no canon to worry about, this series can lean heavily into the sci-fi realm. There are wild ideas at work in a future that is somehow simultaneously bright and Orwellian. How a vigilante hero navigates that makes the narrative more interesting. Like any good sci-fi story, it also allows writers to impart meaning and purpose as we reflect on a possible future and where we went wrong (or in some cases right). The art can be quite rough in this collection and at this point, we all have to admit we’ve been spoiled by so many great artists in the last 20 years that a book like this has no chance. It doesn’t help that every issue seems to be drawn by a different artist. My guess is younger and newer artists were given this series due to its lesser visibility and importance in the Marvel Comics line. It’s unfortunate because there are some rad ideas at work. The overall design of characters is still pretty solid, though. The character dynamics could use some work. The fact that Miguel works for a guy who puts him under house arrest because another company wants to hire him is probably a good sign you work for the wrong person. His brother isn’t very interesting either, and the overall romantic element is half baked. Is there a rationale for the reasons? Revisiting Spider-Man 2099 was a real blast. I enjoyed the character, but also the world and his villains. Now, if Marvel can front a 200 million dollar budget we might just get the coolest superhero sci-fi flick with cyberpunk sensibilities ever made.